If you're reading this now, your cooking is probably done for the next few days. If it hasn't happened yet, within the next several days your thoughts will likely turn to shopping and yet more cooking. So this is the perfect time for us to talk about kitchen must-haves. It's been three years since I posted my 10 Favorite Kitchen Gadgets, something I thought I would do annually. Oh well ... so much for my briskly efficient editorial calendar! Of course, those 10 favorites are still favorites; and here are 10 more. The items on my list range from a few dollars to a few hundred dollars each and are all, with one exception, things I use nearly every day in my own kitchen. What kitchen tools and gadgets do you find indispensable? What's on your wish list? 1 Cuisinart 5.5-quart stand mixer There is also a 7-quart model, but I haven't made anything yet that made me regret choosing the 5.5-quart (pictured above). It has proven more than adequate for my purposes. Like my decades-old Cuisinart food processor, this heavy-duty workhorse will live forever! 2 Thermapen I wish I could buy all of you a Thermapen super-fast instant-read thermometer. I use it all the time to take the temperature of meats, doughs, breads, custards. It's the secret to my perfect eggnog! 3 French rolling pin I have all kinds of rolling pins, but this is my personal favorite. I reach for it more frequently than my straight rolling pin or the big one with handles or the one with ball bearings. 4 Cuisinart food processor I have the Prep Plus now. Before that I had the no-longer-made DLC 10-E, the predecessor of the Cuisinart DLC 10-S 7-cup. It still works beautifully, so I passed it along to a friend when I got the bigger one. 5 OXO Good Grips bench scraper This is great for scooping up chopped vegetables, trimming puff pastry, dividing dough, scraping dough residue from cutting board or counter. 6 Lodge Pro-Logic 14-inch cast iron pizza pan I use it like a pizza stone. Great for artisan breads as well as pizza. When baking a pie, I put a square of foil on the pan and set the pie plate on it. Keeps the oven clean and aids with browning the bottom crust. 7 GIR spatulas Love these unibody silicone tools! One piece of molded food-grade silicone with reinforced interiors, heat-proof to 464 degrees, eco-friendly material, BPA-free, easy to clean and dishwasher safe. Four sizes: mini, skinny, ultimate and pro. 8 OXO Good Grips 11-pound digital scale I still use measuring cups for some things, but weighing flours of all kinds is the only way to go! You can go from weighing pounds and ounces to metric units with the push of a button. Helps in making my rolls the same size and getting equal amounts of batter in layer cake pans. 9 Wusthof Classic 6-inch extra wide cook's knife A really good chef's knife is the most important knife to have, and it needs to have the right blade size for the task and the right handle for your hand. This 6-inch extra wide is shorter than, but just as wide as, the regular 8-inch; and it feels "right" in my hand. Number 10 is something I don't actually have yet, so it's really Number 1 on my wish list! 10 All-Clad stainless steel 2-quart saucier Anyone who makes custards and sauces as often as I do needs this pan. Its sloped bottom allows a whisk or spoon to do a thorough job. This post contains affiliate links. If you purchase something from Amazon through one of my links, I receive a small commission, at no cost to you, which I use toward the expenses of running this blog. Thank you! These are great items. It's worth getting quality from the start. I have a 26 year old Braun food processor that keeps whirling and chopping away. I did a big batch of baking on the weekend and found the small sized silicone spatulas so useful for scraping beaters and other things. They are quickly becoming indispensable.! Lorrie, I'm so glad you're enjoying the spatulas! I can't believe how much I'm using the mini and the skinny, even more than the typical-sized Ultimate. I don't have many of them...time to renew my holiday wishlist! Have a great day, Jean! Ah..the editorial calendar- I always start with good intentions and then it kinda goes awry. The bench scraper sounds like something I want to add to my collection! I've just recently been using a cast iron pot and it has turned into an indispensable tool. Looks like a great list of items. My son has a food processor on his list for me for Christmas, as mine died. I hope I can live without it until then! Angie, I'm sure you hae some gadgets I don't have that I would just have to add to my wishlist! Melissa, I'm glad to hear I'm not the only one whose good intentions about an editorial calendar go awry! I hope you can, too, Linda! :D I used to do everything by hand most of my life, but I am getting more dependent on my "gadgets" all the time. The other day as I was chopping tons of vegetables in my food processor for soup, I thought what it would be like if I had to do it by hand -- I know, on that particular day anyway, I wouldn't be making that soup! Hi Jean, The thermometer would be great to have. 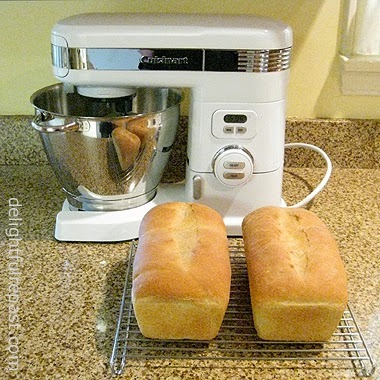 I don't bake as often as I once did and I am actually trying to downsize my kitchen gadgets. Thanks for sharing these wonderful items with us. Enjoy the weekend. Mildred, I know what you mean! I try to eliminate all but what I really use - my closest nearby friends have benefited from my purgings! I’m in for 2 out of 10. It would’ve been only 1 out of 10, but I think I can use that Thermapen for a fever thermometer. Not that I ever get a fever, but if I do, I’ll just stab that sucker into my thigh and take a reading. Pretty clever, huh, huh? The other gadget I like is the pizza pan. But then, I kind of like the one I have now which looks similar, except that it has holes in the bottom to do something or other or prevent something or other. Hope you had a great Thanksgiving! Sully, please don't jab yourself in the thigh with a thermometer - I can tell by looking at you and jiggling your leg that you're done! Good idea, Maureen! And you're going to love it - and wonder how you ever got along without it! Yes, no matter what you're doing, cooking or anything else, it always helps to have the proper tools! Thanks, April. Yes, I love my Wusthof Classic knives! I'm not one to have a bunch of stuff in the kitchen I don't use. This is a great list of kitchen gadgets. I agree with you on the thermopen too. Awesome tool.I shared this on my Pinterest page also. Thanks, SFJ! And thanks for the Pin, also - always appreciated. I was googling All-Clad reviews and your page came up! I must say I am a bit surprised that you prefer non-stick. I consider stainless steel to be much more versatile and I am also a little nervous (perhaps unnecessarily so) about chemical leaching from non-stick. As far as having to cook with oil on stainless, we invest in a good quality olive oil which adds wonderful flavor and health benefits used in small amounts. For those in Northern California I recommend taking a trip to the Olive Oil Factory in St. Helena. For especially "sticky" foods, I usually rely on my enameled Le Creuset fry pan. Sure, the food doesn't slide right off, but I find it fairly easy to clean. Thanks, Elisa. No, I do not prefer nonstick. Number 10 on the list above is one of my favorite pans. I also have it in the 3.5-quart. I have only three nonstick pans out of *many*. One is the All-Clad square griddle which I use only for pancakes. One is an 8-inch that I use strictly for crepes. One is a 10-inch I use for omelettes and sometimes for scrambled eggs. Other than that, it's stainless steel all the way! I, too, am nervous about chemicals, and I don't think we are worrying unnecessarily! I treat those nonstick pans with kid gloves because the second they get the tiniest gouge, I'll be throwing them out for that very reason.